Edward Krasiński’s installation Untitiled (from 2001) with 12 mirrors and tape is currently presented by Tate Modern. His work is a part of a group exhibition: A Bigger Splash. Painting after Performance (until April 2013). The exhibition explores the impact of performance on painting since 1950s. Curators of the exhibition trace relationships between performance and painting through familiar and less familiar body of work. The show features pivotal post-war Western European artists: David Hockney, Jackson Pollock, Niki de St Phalle, Ives Klein, Cindy Sherman. Next to their works, there are less known experimental works of artists from Korea, Japan and Eastern Europe: Yayoi Kusama, Ewa Partum, Ei Arakawa and Edward Krasiński’s installation along with Eustachy Kossakowski’s Photographs. Chris Dercon, Tate Modern Director called A Bigger Splash.. an exhibition that reflects Tate Modern’s interest in weaving major and minor histories together. Calling the exhibition a partial story rather than a comprehensive survey. (Catalogue, p.6, 2012). Krasiński’s installation presents a series of 12 mirrors suspended from the ceiling. The single strip of scotch tape across them is stuck horizontally. The tape expands beyond mirrors’ surfaces on walls of the room. The photographs of Eustachy Kossakowski complement Krasiński’s installation. The photographs documented the artists’s explorations of space and actions in his atelier and home where living space was incorporated into artworks. Furthermore, we can see how Krasiński incorporated even family members and friends in his environmental work by binding them with scotch tape. Krasiński’s actions could be compared to “total artwork” where real space overlapps with his artistic space bound by blue tape. Additionally, in this installation, mirrors’ reflections multiplies the sensation of the space, highlighting the relationship between object, spectator and gallery space. Krasiński’s installation was acquired by Tate collection in 2007. Interestingly, this acquisition is a part of a broader strategy. Since 2000, Tate has been extending the collection by adding works from beyond Western Europe and North America. To built the collection from as wide geographical reach as possible. The exploration of art in Eastern Europe continues. In November 2012 a new Acquisitions Committees focusing on Russia and Eastern Europe (REEAC) was launched. Tate collection comprises nearly 70,000 works spread across Tate Britain, Tate Modern, Tate Liverpool and Tate St. Ives. 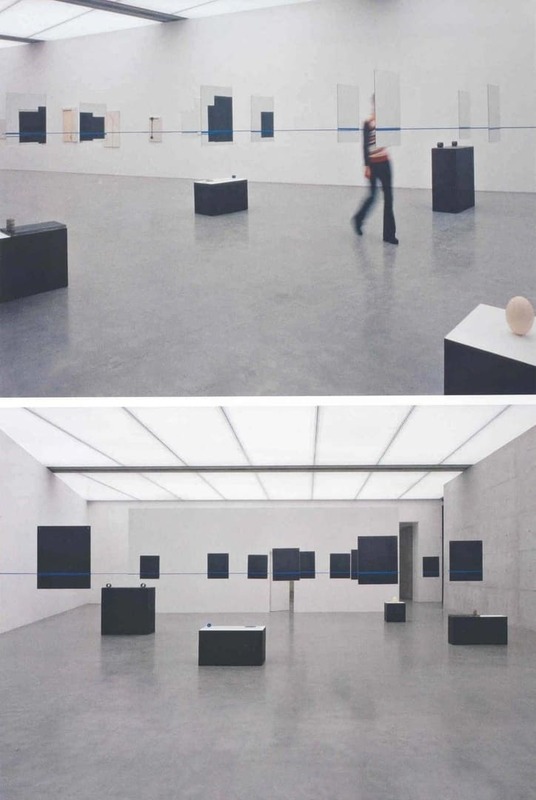 Edward Krasinski, Untitled 2001, installation with 12 mirrors and tape, each 500 x 600 x 4 mm. 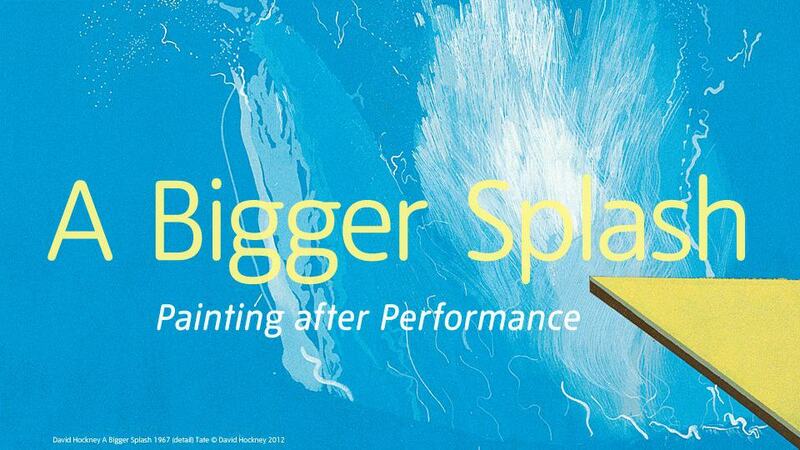 Presented by Tate Modern at the group exhibition A Bigger Splash. Painting after Performance. (November 2012 –April 2013). © The estate of Edward Krasinski, Foksal Gallery Foundation, Warsaw.